Animal rights organisation Peta has caused a row by claiming Steve Irwin was killed while "harassing" a stingray. Wild animals should be "left alone in their natural habitats", the group wrote in response to a doodle by Google celebrating the TV conservationist's life. The Australian wildlife advocate was killed by a stingray in 2006. There's a wildlife reserve in his name in Queensland. 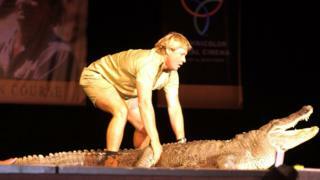 Steve Irwin, who would have turned 57 on Friday, was probably best-known for his Crocodile Hunter series. He described his "mission" on earth as being to "save wildlife". But Peta angered his many fans by describing his method of conservation as "harassment". In his shows, Steve Irwin would approach animals in the wild - often grappling with crocodiles or holding snakes up in front of the camera. He believed that teaching people about wildlife was the way to save the creatures, and that the passion he showed on screen helped "push an educational message". And while Peta accuses Steve Irwin's shows of trying to excite audiences "at the expense of animals", wildlife conservationist Anneka Svenska says that what he did "has inspired the next generation of conservationists". "Probably now it wouldn't be looked at as so good to touch the animals like he used to," she tells Radio 1 Newsbeat. "But at the time he was doing it, it inspired loads and loads of children to go on and work with animals." People reading Peta's criticism online felt similarly to Anneka. At the time of his death, the Guardian published an opinion piece by author Germaine Greer claiming the animal's had "got their revenge". "What Irwin never seemed to understand was that animals need space," she wrote. "There was no habitat, no matter how fragile or finely balanced, that Irwin hesitated to barge into. "There was not an animal he was not prepared to manhandle. Every creature he brandished at the camera was in distress." Lots of the animals Steve Irwin was filmed with lived in Australia Zoo, which his family still owns today. Anneka, who's a wildlife TV presenter, disagrees with keeping animals in captivity, but says what Steve Irwin did has to be put "into balance". Anneka says that she wouldn't choose to touch wild animals because "they need to be left to be as they are". She's recorded programmes with lots of rescued wolves, but says approaching them in the wild would put them in danger. "If I was to go out into the wild and start feeding or interacting with wolves then you end up with a lot of dead animals because they become too tame," she says. "Touching animals in parks that are used to being touched" is fine, Anneka says. "I think the criticism comes when he's in the wild and chasing down animals in the wild." Steve Irwin was accused of breaking wildlife laws while filming in the Antarctic in 2004. Promotional material for his documentary Ice Breaker claimed he "slides down hillsides with penguins, almost rubs noses with the notoriously dangerous leopard seals and spends the most inspiring time with two friendly humpback whales". He was cleared of breaching the rules after an investigation. But his biggest controversy came when he walked into a crocodile enclosure with a dead chicken in one hand, and his one-month-old son in the other. Headlines following the incident branded him as reckless and irresponsible, and led to an investigation about whether he'd breached workplace regulations. But Anneka says she's a big fan of Steve Irwin, like seemingly most people on the internet. He's remembered fondly as someone who helped teach people about animals that might otherwise have been seen as scary. "I still really like Steve Irwin, I was a fan of him, I think he did a lot of good," she says. "The powerful influence he's had on children and how they love animals and how they engage with animals has been extremely valuable. "I think if you have to weigh up the good and the bad, he did more good than bad."